For more proof that fleeing the scene of a crime is a bad idea, a video circulating the web shows a driver trying -- and repeatedly failing -- to flee after his vehicle strikes a Chicago cab. 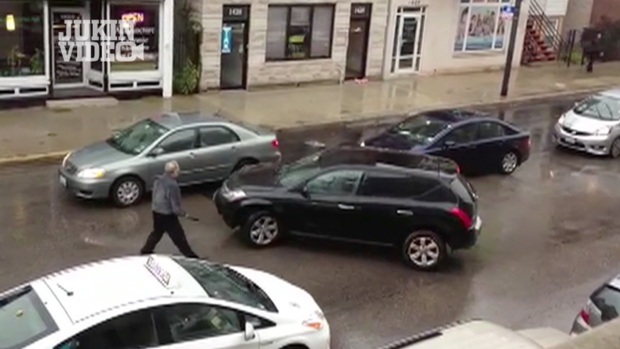 The video begins with the cab driver in the middle of the street in the 1400 block of West Belmont Avenue, urging the driver to get out of the car. The car's driver slowly backs up and tries to turn around before driving back toward the cab. The cabbie follows the car, at several points shaking what looks like a baton. The driver of the car tries to pull around him, but instead strikes another cab. 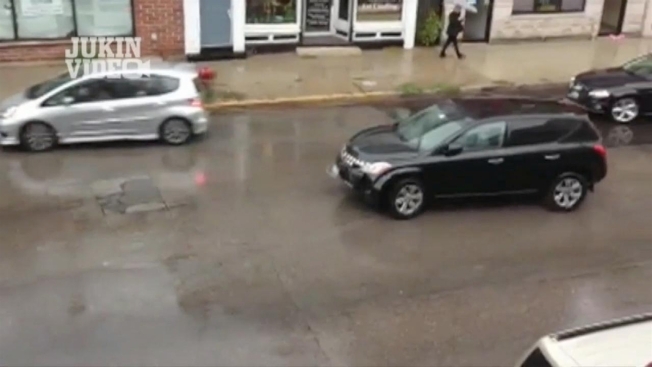 The video shows him backing up and crashing in a parked car then pulling forward, crashing again into the first cab and another car and fleeing the scene. A 20-year-old man was arrested after allegedly smashing into several cars on the North Side before fleeing the scene. Witnesses heard the cab driver ask the motorist for his insurance. "He tried to just take care of things peacefully in the beginning, but then once he saw that he was trying to take off, that's when he took it upon himself to get traffic to stop him," witness Karen Morris said. "It looked like it was straight out of a movie. We were all just stunned." Adding to the driving debacle, Police News Affairs Officer Janel Sedevic said the 20-year-old motorist, who didn't own the car he was driving, then crashed into a tree off-camera. It all happened around 4 p.m. Oct. 30. Sedevic said the driver was arrested and charged with several traffic misdemeanors as well as criminal trespass of a vehicle and damage to city property (the tree). Kevin Moore shot video of the incident from his balcony. "He definitely revved up his engine and acted like he was going to run over the cab driver a few times," Moore said. Five cars were damaged, including the car he was driving and the cab he initially struck, Sedevic said.